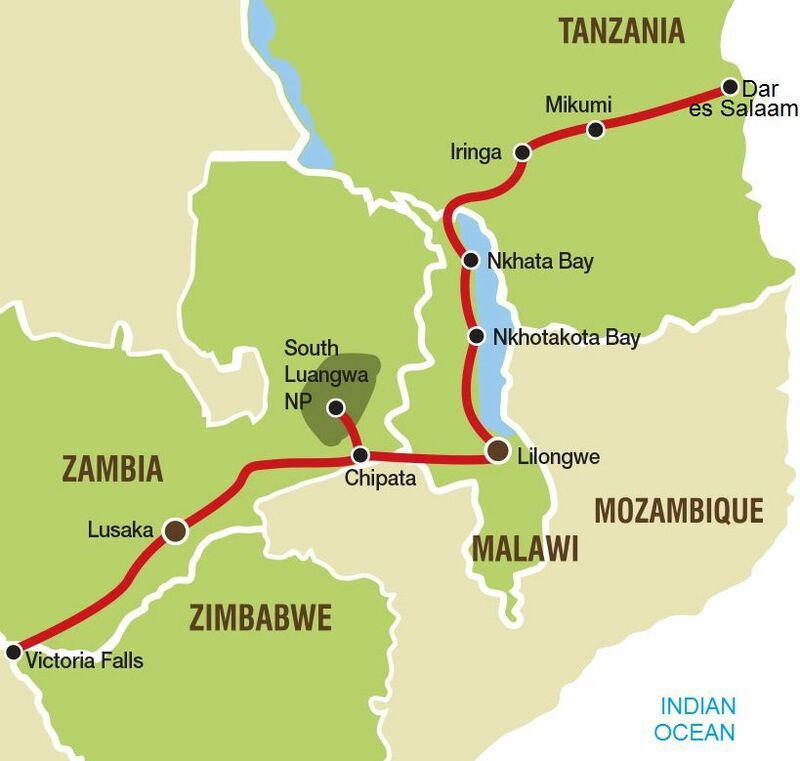 The Zambia and Malawi tours and safaris take place over 11 days. This overland adventure tour departs from Victoria Falls in Zimbabwe and ends in Dar es Salaam in Tanzania. We recommend that clients arrive a day or two early to spend time at one of the 7 natural wonders of the world– Victoria Falls! Highlights of our budget Zambia and Malawi tours include Lake Malawi and South Luangwa National Park in Zambia. This park is known for its high concentration of leopards and hippos. Not only will you see lots of wild animals on the safaris during these tours, but we combine some spectacular natural landscapes and diverse cultures to make this trip unforgettable. This tour forms part of the 21 day "East Africa Adventure" (North) from Vic Falls to Nairobi. Our Zambia and Malawi adventure tour begins as we set off early from Victoria Falls when we catch a last sighting of the mighty falls before crossing the border into Zambia. While we have a long day travelling today, we get our first impressions of the Africa that awaits us. Colourful markets, busy villages and rural scenes form the backdrop of our journey to the outskirts of Lusaka. We enjoy a prepared meal on arrival as our guides brief us on the days ahead. Since the tour departs from Victoria Falls on day one, we always highly recommend that clients arrive at least one day earlier. This gives you time to acclimatize and to see the wonderful falls and the town. The Kariakoo Sleep Inn Hotel in Dar es Salaam is located only 20 minutes from the main International Airport. The hotel has spacious rooms, honey moon suites and normal suites. For your convenience there is free wi-fi, a business center, access to a bank, pharmacy and several shops in the immediate vicinity.